Slowly but surely, the best Android handsets on the market are becoming available. First it was the HTC Desire on contract that showed up on T-Mobile's online shop, which you have 7 days to wait out until delivered to your doorstep. 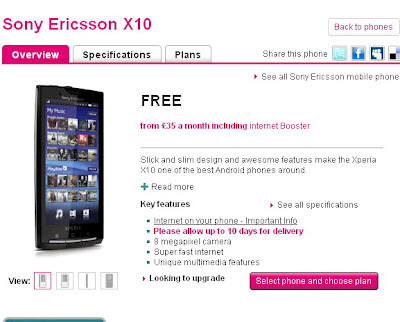 Now it's Sony Ericsson's X10 that is available on T-Mobile contract though you actually have to wait 10 days until it's delivered to you. The Sony Ericsson X10 shares the same processor as the HTC Desire though it's Android OS is a bit dated than the former. The only thing that the Sony Ericsson X10 has over the HTC Desire is its 8 megapixel camera and the larger screen but I don't think that would justify the fact that the X10 is more expensive on contract on T-Mobile. The HTC Desire can be bought for £164 with a £10 a month mobile contract for 24 months while the Sony Ericsson X10 can be bought, on the same contract for £226. I mean, I could understand the higher price on contract if the X10 has outstanding picture quality of 720p video recording but if you read my Sony Ericsson Xperia X10 Review, I don't think the camera will justify the higher price. Vodafone on the other hand has the Xperia X10 on contract for free with a £35 a month tariff. Still higher compared with the HTC Desire. Orange also has the Sony Ericsson Xperia X10 on contract. The lowest monthly plan they're offering for the X10 is with a £22.5 monthly contract and you have to pay £149.99 for the phone. The X10 is free on Orange if you subscribe to their Panther 40 monthly tariff (£35 if purchased online). Anyhoo, it looks like my comparison between the HTC Desire, HTC Legend, Google Nexus One, and Sony Ericsson Xperia X10 would soon go to actual testing once I get my hands on these phones.